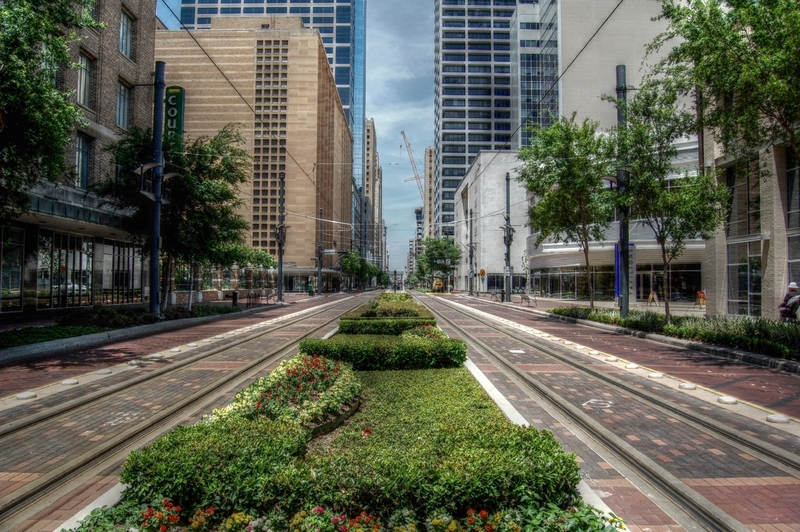 On a busy downtown street, creating a transitway along a central median provides a high-capacity transit facility with few conflicts, and can be used to create a series of linear plazas, transforming the character of the street. The downtown median transitway preserves the priority of a long route such as a BRT or LRT line as it transitions from larger corridors or off-street rights-of-way; it can also serve a set of local routes that come together on a downtown street. This configuration, similar in size to many neighborhood main streets, fits well in moderately sized downtown streets, and other pedestrian-friendly places, with accommodation of private motor vehicles and bikes in a low-speed shared lane for local access by all modes. 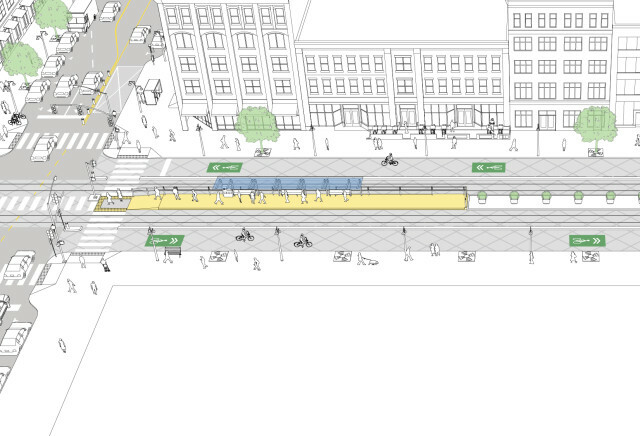 Traffic volumes can be further reduced by providing block-long plazas on alternating sides of the street, with opportunities for bicycle-only or bus and bike access in the side lane. The transitway is separated through grade changes, textured pavement, curbs, or other barriers, so general traffic is either deterred or physically prevented from entering the transitway. 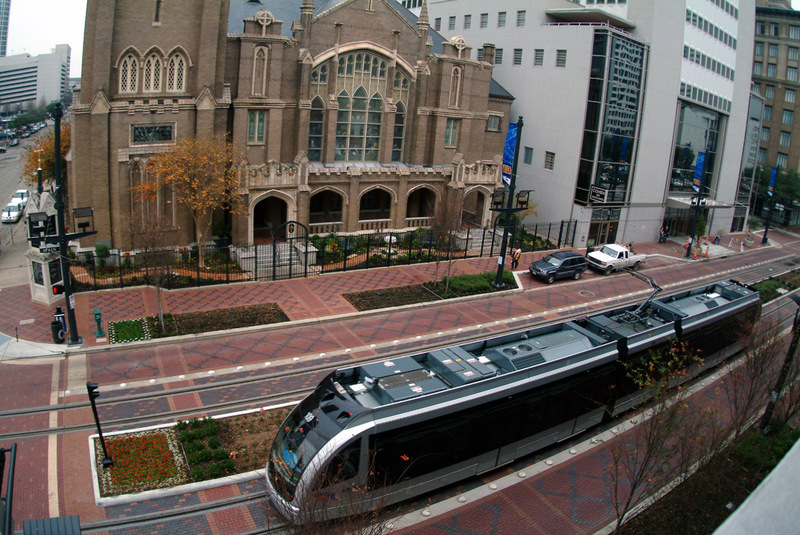 Stations promote the visibility and attractiveness of transit service, with the opportunity for high-quality amenities, passenger information, and streetscape beautification. Median transitways can include green infrastructure and environmental enhancements within the transitway. 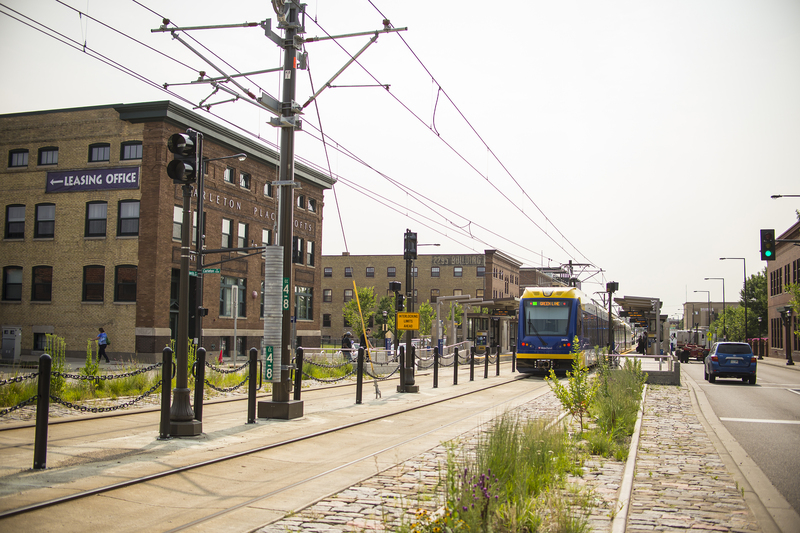 Durable urban materials such as brick, stone, and unit pavers can be used on the transitway or across the entire right-of-way. While curb and sidewalk reconstruction can introduce distinctive pavement materials and green infrastructure, a median transitway can often be implemented independently of a curb reconstruction, saving time and money. At intersections, special attention is required. Use separate turn phases, prohibit left turns across the median transitway, or prohibit left turns when transit vehicles are present. Extend vertical elements to the intersection edge where turns are prohibited. Use transit signals and either active TSP or transit signal progressions. Crosswalks from median to median enable safe and convenient pedestrian access to stations, and should be provided when turns across the transitway are prohibited. Large refuge spaces accommodate groups of alighting passengers, and improve pedestrian safety and access by shortening crossing distances, and reducing the number and complexity of movements and potential vehicle conflicts that pedestrians are exposed to. Refuges allow slower pedestrians to break up their crossings, and allow more flexible signal timing plans. Where pedestrian crossings traverse tracks and bus transitways, audible warnings ensure all pedestrians are aware of oncoming transit vehicles. On the Macrobús BRT corridor in Guadalajara, introduction of the central median has been credited with reducing injury crashes 35%. Each additional meter shortened from pedestrian crossings was found to decrease pedestrian crashes 6%. Nicolae Duduta, et al. Traffic Safety on Bus Priority Systems. WRI Ross Center (2015). Bicyclist volumes will likely be high due to the high density of destinations along the corridor. Where space exists, protected bike lanes are recommended. Bicycles may also be accommodated in shared travel lanes where speeds are low. Accommodate bicycle turns at right angles using two-stage turn queue boxes. Where motor vehicle through-traffic is prohibited, consider providing a cycle track through the plaza. 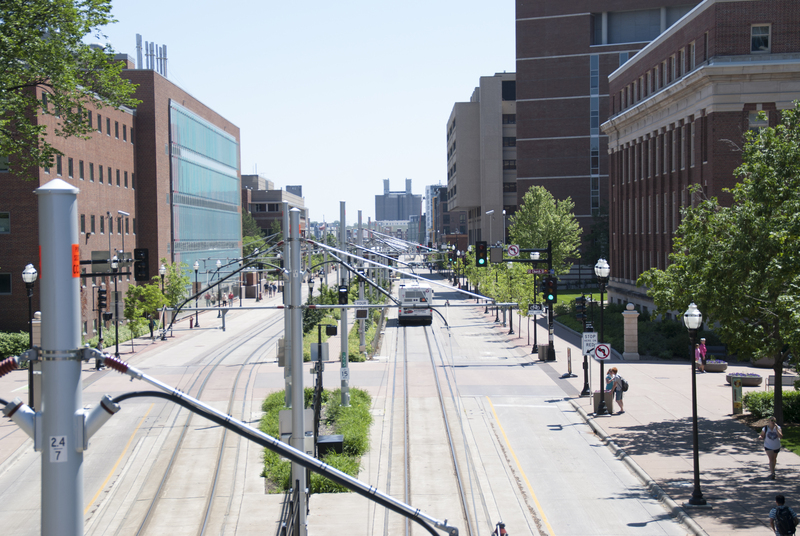 One platform can serve both travel directions, or platforms can be staggered across an intersection or along a block. Staggered split platforms provide higher passenger capacity on relatively narrow medians. References for Downtown Median Transit Street: 1 found.